Mexico’s Silver Libertad coin is growing in popularity among investors and collectors around the globe. Though it features an equally stunning design and purity to counterparts such as the American Eagle and Canadian Maple Leaf, this coin has only recently attracted greater attention. 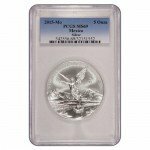 Right now, the 2015 5 oz Silver Mexican Libertad coin is available from Silver.com. Given a near-perfect grade by the Numismatic Guaranty Corporation. 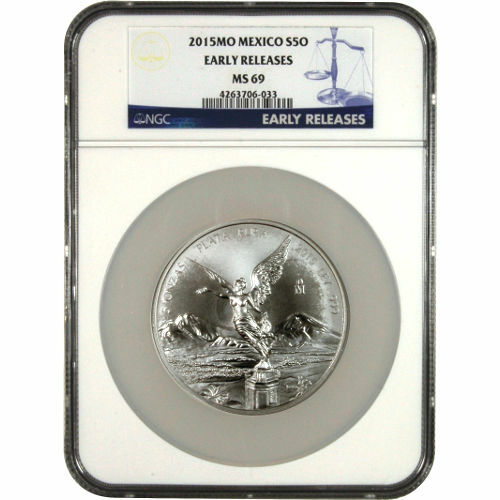 Part of the Early Release Series from the Mexican Mint. Ships in an NGC plastic slab with certification label. Silver Mexican Libertad coins use imagery inspired by the gold Centenario coin issued by the Mexican Mint in the 1920s. At that time, Mexico was celebrating the centennial of the start of its War of Independence from Spain. The modern Libertad coin was introduced in 1982, with this 5 oz. weight added to the series in 1996. 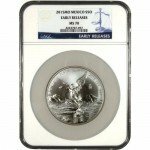 Each coin available to you through this Silver.com listing is in Mint State 69 condition. These near-perfect coins have their full, original luster, and no more than two minor detracting marks or other flaws. 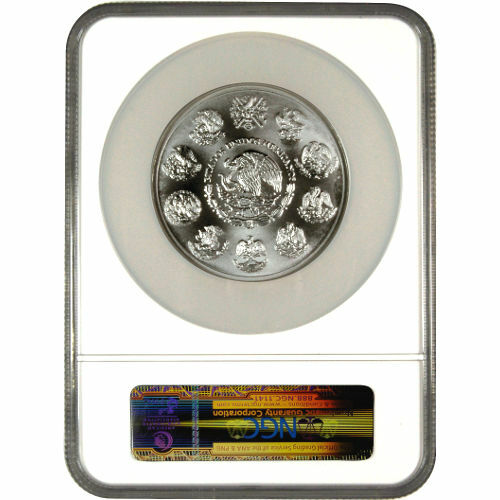 As part of the Early Release series, these coins were received by the NGC during the first 30 days of production in 2015. On the obverse side of each coin is the image of the statue of Winged Victory. Her image is featured on the Mexican Independence Victory Column in Mexico City, which was constructed starting in 1921. The reverse side of each coin bears the modern coat of arms for Mexico in the center, with 10 different historic versions of the coat of arms encircling it. The modern coat of arms bears the engraving “Estados Unidos Mexicanos” around the top, with a wreath around the bottom. These coins were all struck by the Mexican Mint with permission of Banco de Mexico. The Mexican Mint was founded in 1535, making it the oldest operating facility in the Western Hemisphere. Silver.com associates are here to answer any questions you have about these products, and we encourage you to reach out to us on the phone at 888-989-7223, online through our web chat, or by sending us an email. If you are interested in similar products, check out our selection of Mexican Silver Libertads.